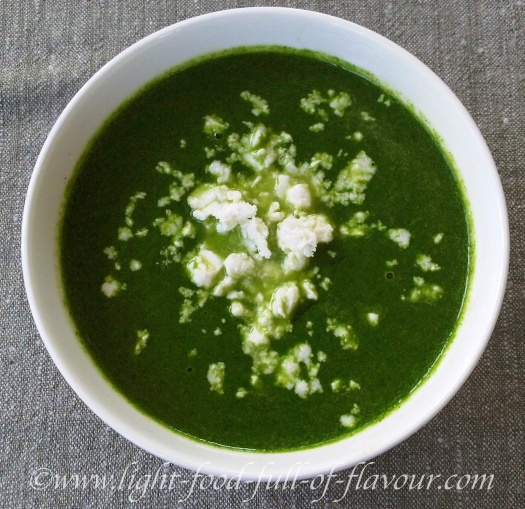 Tasty and healthy - a watercress and spinach soup which looks stunningly green thanks to very little cooking. The less you have to cook most vegetables, the better it obviously is nutrition-wise but it also makes the vegetables retain their vibrant colour. 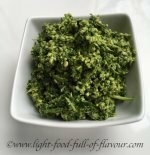 If you haven’t tried watercress before, you should know that it has a strong taste - it’s properly peppery like rocket, but it is also a nutritional goldmine. Take a look at Nutritional Information to see what goodies watercress contains. I add watercress to a lot of salads (Salad Recipes) as well to increase the nutritional value, but if the watercress is “older” with thick stalks, then I remove the thickest part of the stalks before adding to the salad. But not so for this soup where I use all of the watercress. You need to use quite a large pot when making this watercress and spinach soup as the spinach takes up a lot of room until it has wilted down. 1. Start with the watercress by separating the leaves from the stalks. Put the leaves to one side and chop the stalks roughly. 2. In a large pan, gently fry the onion and the stalks from the watercress in the butter and olive oil until the onion is soft, around 5 minutes. Be careful it doesn’t burn. Heat up 300ml, 10floz, 1.3 cups, of water to boiling point. 3. Add the watercress leaves, the spinach and the hot water to the pan, increase the heat and stir until the leaves have wilted and the water comes back to a simmer. This should only take 1-2 minutes. Take the pan off the heat and add the ice-cold water to the pan to stop the vegetables from continuing to cook. 4. Either blend the soup with a stick blender in the pan or use an ordinary blender (depending on the size of your blender, you might have to do this in batches) and then return the soup to the pan. Reheat the soup and serve in soup bowls and either crumble over some feta cheese or add a dollop of natural yogurt to each bowl.